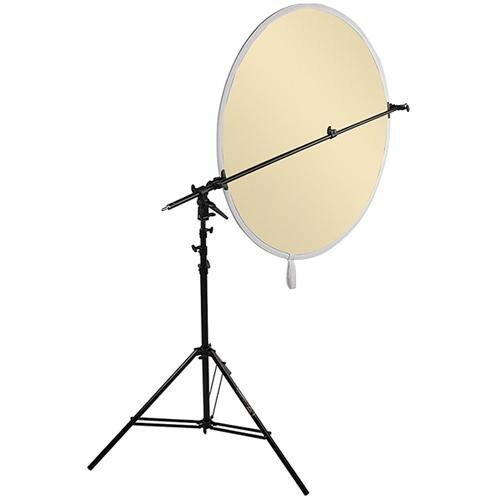 The 5 Surface MultiDisc collapsible reflector is designed for use in the studio, or on location. It adds light to shadow areas, adds or subtracts color casts, or diffuses harsh light. MultiDiscs start as a White Translucent disc, with a reversible, zippered slipcover that provides white, silver, gold and soft gold surfaces. Each MultiDisc has a sturdy spring-steel frame that is covered by a heavy duty white fabric. With a twist of both wrists (and a little practice), they collapse to 1/3 their open sizes. Each comes with a nylon storage bag. The Telescopic LiteDisc Holder and LiteStand act as your assistant to hold the disc in place exactly where you need it to be.